Floyd “Money” Mayweather, Jr. or “The One” or TBE (the best ever) if you prefer, is right about being one of the best ever. He describes his abilities accurately when he says fighters always come against him with a plan, but as soon as the fight starts, the plan goes out the window. Money leaves the ring with another win and a wad of cash. So far, no one has been able to carry out their plan and come away with a win. Saul “Canelo” Alvarez (and his fans) was certain he had a good plan, and even alternatives if the first one didn’t work. He felt he was “the one” with the necessary skills to carry it out. When the opening bell sounded, both men cautiously circled one another, wary of possible danger. Canelo tried to establish his jab, and sent a few rights to the body. Mayweather countered with his own jab, and both men started to feint. The pattern continued, with Canelo stepping up his attack, but it was obvious he was quickly developing an appreciation for Mayweather’s elusiveness. He was finding out the hard way just how fast and clever Floyd, Jr. is when the bell rings. He was convinced he had the necessary speed and intelligence to catch him. Instead he started getting hit with blinding counters. By the middle rounds, Canelo seemed to forget an important part of his plan. He foolishly stopped moving and using feints and began to stand stationary in front of Money. He got sucked into “posing”. It played right into Money’s hands. Floyd has the speed and reflexes to get away with it. Canelo started paying for his decision. 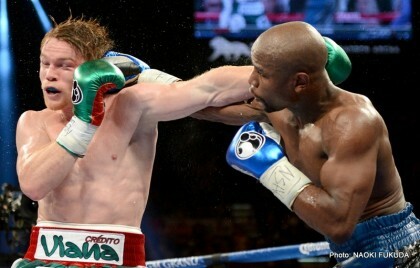 Money’s lightning fast jab threaded its way between Canelo’s gloves and snapped his head back. He mixed in a good portion of right hands for good measure. That was the pattern. The only difference was it became more one-sided. Money began to school the younger fighter, wisely dominating the first minute or two of a round, and then resting for a minute or more. Money walked away with another relatively easy victory, and pocketed a whole hell of lot of moola. Canelo didn’t do so bad either, but he lost his first fight. The only consolation he carries away is he didn’t get beat up. Canelo will be boxing long after Money retires. Who knows, maybe Floyd, Jr. will sign Canelo to a promotional contract? Money seems much more subdued since his incarceration, but he remains flamboyant, explaining that his job is to sell his “life style”. He backs it up with displays of his loot: expensive cars, bling, houses and paid hangers-on too numerous to count. Part of his stic is to preach to his young viewers, telling them they too can be successful if they work hard and dedicate themselves to their task. Good advice, but hardly original, and all the kids are going to remember is Floyd, Jr. waving around all the trappings of his success. He is right about one thing. He is one of the best ever. The fight between Lucas Matthysse and Danny Garcia was the surprise of the night. The surprise was it went the distance. Both men are such big punchers that the expectations were one would bludgeon one another unconscious before the final bell rang. Matthysse was thought to have the edge. His high percentage of KOs suggested it. Surprise! It was the ease with which Garcia out boxed Matthysse, and how he was able to take Matthysse’s punch. In the sixth or seventh round, Matthysse’s right eye started to rapidly swell shut. His corner men at first applied enswell, but then resorted to applying pressure with the thumb. The idea was to push the swelling off to the side toward the temple and side-burn areas, hoping the eyelids would open a bit. Surprisingly, the tactic seemed to work, but most cornermen wouldn’t recommend it. Early on Matthysse was the aggressor. He did a good job of getting under Garcia’s counter left hook, but he failed to counter Garcia’s counter with his own right hand. He could have tried a check hook too, but did not. The missed opportunity of possibly landing his big right hand was significant over the course of the fight, because Garcia started landing the left hook with more and more success. It encouraged him to throw more combinations, both to the head and body. Matthysse continued to try and land the big one, and he did get through with what appeared to be a crushing right hand. The punch sent Garcia’s mouth piece flying out of his mouth. Unfortunately for Matthysse, referee Tony Weeks chose that moment to stop the action and lead Garcia over to his corner to have the mouth piece replaced. It gave Garcia much needed time to recover if he needed it. No one but Danny Garcia really knows how shook up he might have been. As the fight continued, Matthysse started missing by bigger margins. In the eleventh round, he suffered the first knockdown of his career when he was caught on the ropes, and got tangled a bit. Punches landed, though, so a knockdown was scored. Garcia threw quite a few punches south of the border, and finally in the twelfth round it caught up with him. He was penalized a point. Matthysse bravely struggled through his vision problems and kept on trying to land the big one, but everyone knew his his best chances had passed. So, the big surprise was both men’s ability to take the other guy’s punch. Some might argue that the biggest surprise of all was one judge scoring the Mayweather vs Alvarez fight a draw! It’s worth noting the same judge had Bradley beating Pacquiao. Where’s Teddy Atlas when you need him to harangue a bit about the inept scoring! Next boxing news: CJ Ross: I Stand Behind My Decision …. The Fight Was a Draw!